Page added in April 2018. Photos taken in February/ March 2016. 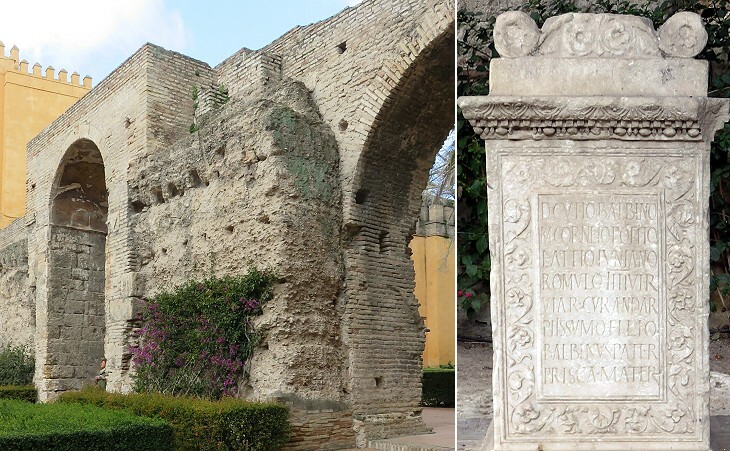 You may wish to see two introductory pages to this section or a page on Roman Seville first. 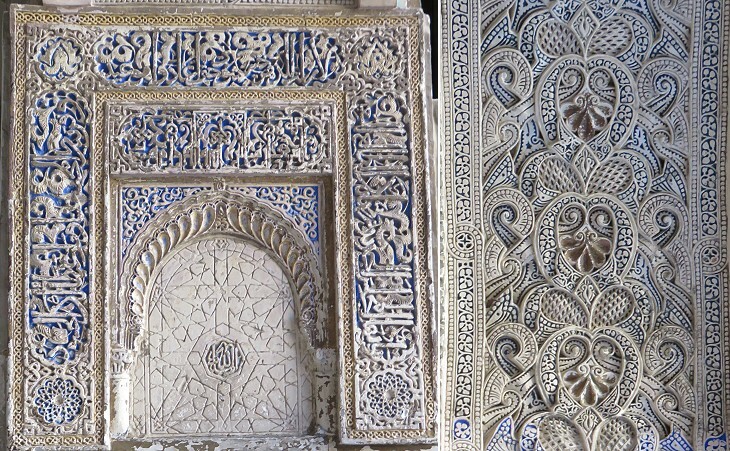 I arrived yesterday morning in this capital of Andalusia; and as soon as we had dined and dressed ourselves, walked out with no particular object in view, but merely to stroll through the streets, by way of making ourselves acquainted with the city; chance led us into the court of the Alcazar, or royal palace. (..) Near the western entrance was formerly to be seen a stone seat, with its canopy supported by four pillars, all now destroyed. Here that severe judge, Don Pedro (Peter, King of Castile and Leon in 1350-1369), sat to decide causes, and give sentence upon malefactors. His justice was so very inflexible, that in those days of feudal anarchy, it was looked upon in the light of wanton cruelty and tyranny; perhaps that unfortunate monarch owes to the hatred of those he meant to reduce to order, much of the obloquy which has been so plentifully bestowed upon him by historians, who have painted him to us as a tyrant so bloody, so wicked, as almost to exceed the bounds of probability. 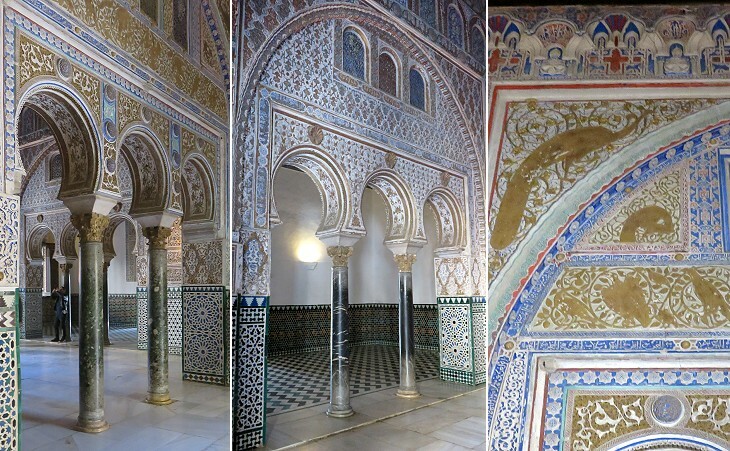 In Andalusia, where he fixed his residence, and seemed most to delight, his memory is not held in the same abhorrence. The Sevillian writers speak of him very differently; and instead of his usual appellation of Pedro el Cruel, distinguish him by that of El Justicero. Now visit the Alcazar. 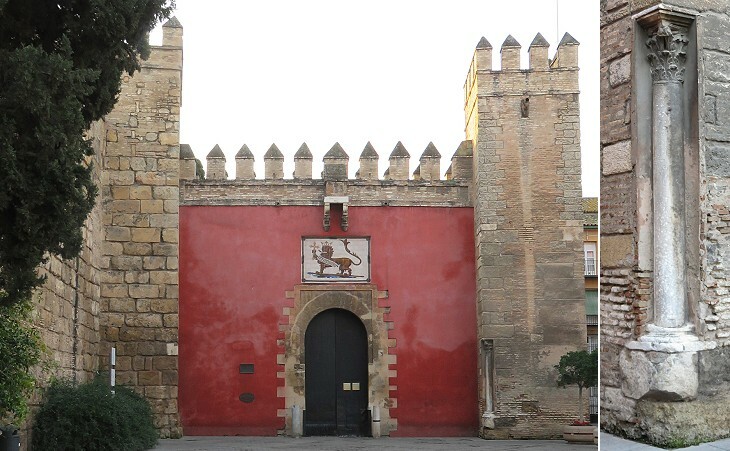 The Alcazar is entered by two gates, either bv that de las Banderas where the colours are hoisted when the king is residing, or by that de la Monteria (after "monteros" beaters, who had their quarters near the gate) from whence he sallied forth to the chase. In the XIVth century the Spaniards counted the years from 38 BC, the date which was regarded as the establishment of Roman rule in Spain. A similar usage can be noticed in other parts of the Roman Empire, e.g. at Caesarea Philippi (Banias) in the Golan Heights. 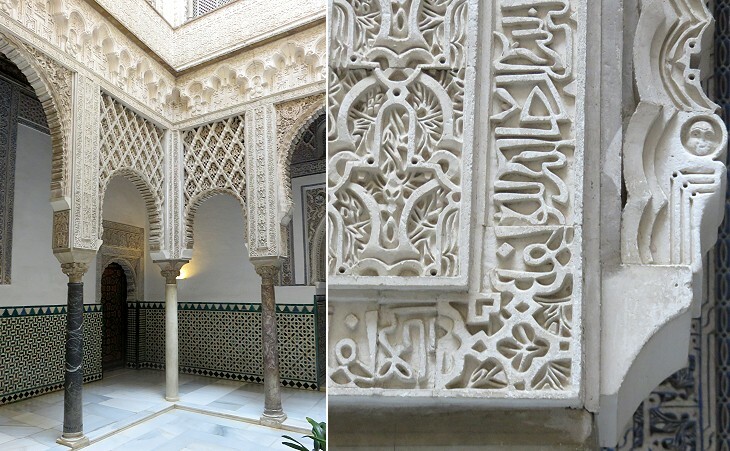 The patio is named after a legendary account saying that the Emirs of Seville were entitled to receive 100 maidens from the Christian States every year. 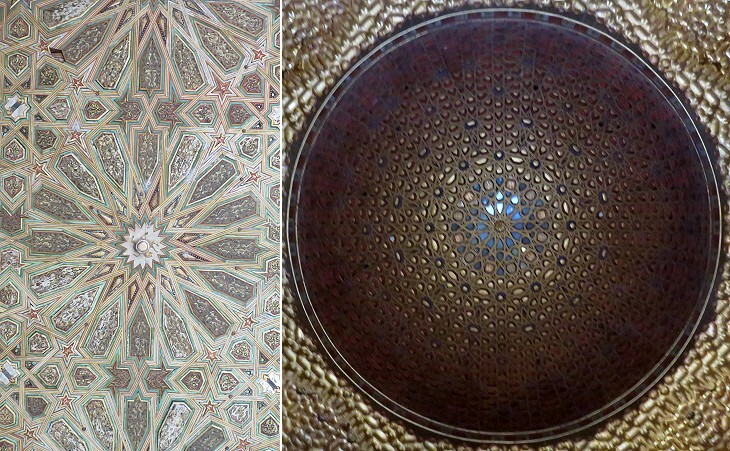 The dome of this hall which was used for the most important ceremonies was designed by Diego Ruiz in 1427. 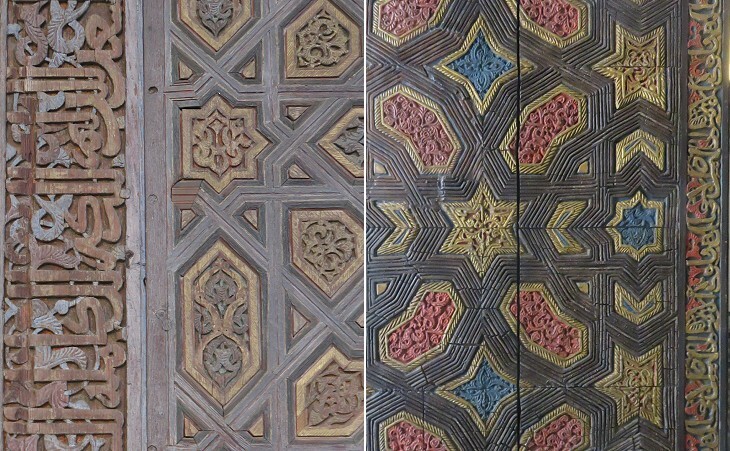 Wooden ceilings in mudéjar style are known as artesonado and were popular well into the XVIIth century (see that at the Aljaferia of Zaragoza in the introductory page). This patio is in the private part of the Alcazar, the oldest one which is believed to have been built by the Caliphs of Cordoba. 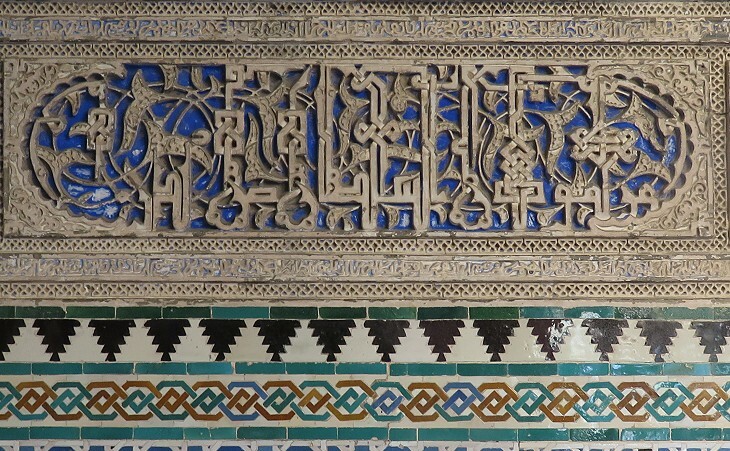 Its plasterwork and tile decoration was largely remade in the XIXth century. 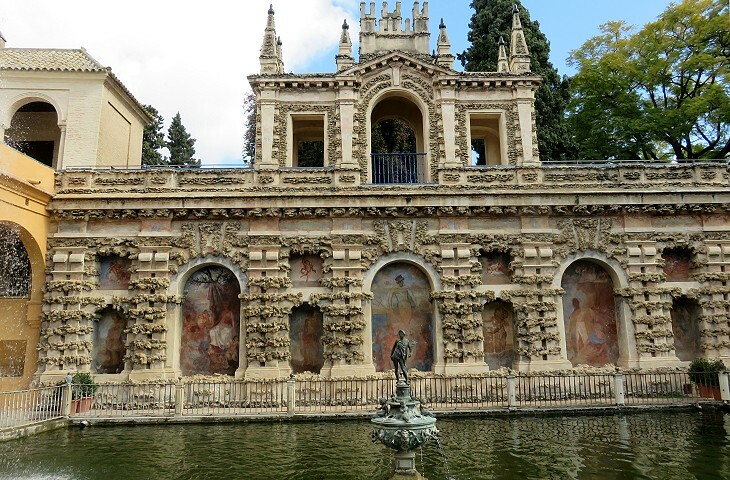 You may wish to see Zisa, a palace in Palermo which was designed by Arab architects for the King of Sicily. 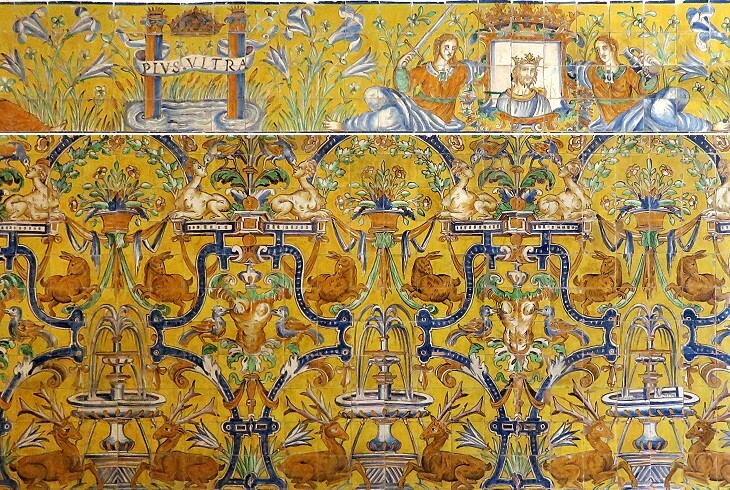 The beautiful tile decoration of this hall was made in 1577 at the request of King Philip II as a tribute to his parents. Plus Ultra (Further Beyond) meant that Charles' empire spanned beyond the Pillars of Hercules (the Strait of Gibraltar) which were symbolized by two columns. 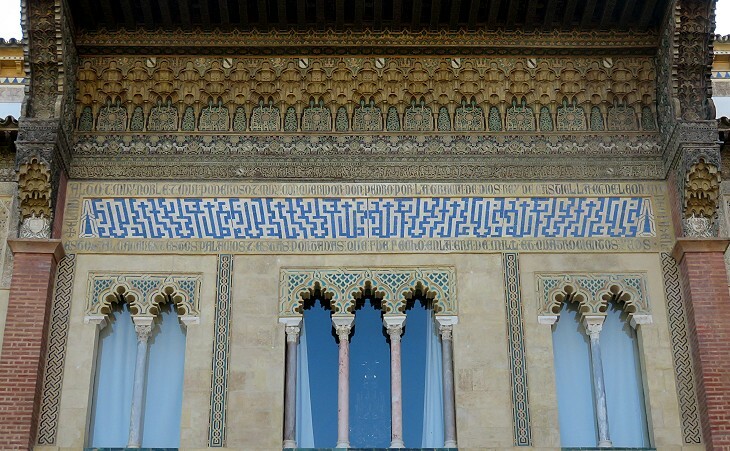 The motto was suggested to the then young prince in 1516 by his Italian adviser and physician Luigi Marliano (see Plus Ultra in monuments at Messina and Palermo in Sicily). Historians record five wars between Charles V and the Kings of France; the Emperor's armies defeated the French ones in many battles, but because they occurred between Christians, they did not bring Charles the same glory as his conquest of Tunis in 1535. The event was celebrated as a major triumph of the Christian faith and Charles crossed Sicily and southern Italy on his way to Rome where he was crowned as an ancient Roman commander. 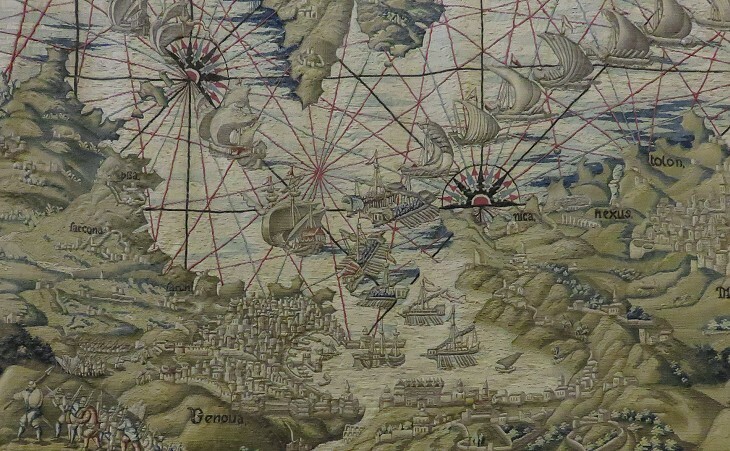 The expedition to Tunis was made possible by the support of the Genoese fleet. It was depicted in a series of Brussels tapestries which were made in 1554. The Low Countries were one of the many possessions of Charles V.
It appears that the Romans were not so negligent as the Spaniards in taking care of the roads and highways although they used no post coaches. For the administration of persons who had been consuls and pro consuls was employed to keep the public paths clean and neat. In the garden of the Duke of Medina was found a pedestal of white marble with flowered borders on which a statue had once stood with letters inscribed as follows "D CVRTIO BALBINO M CORNELIO POTITO L A TTIO IVILIANO ROMVLO IIII VIR ViAR CVRANDAR PIISSIMO FILIO BALBINVS PATER PRISCA MATER". Hence it seems that Curtius Balbinus was one of the four commissioners of roads at that time. 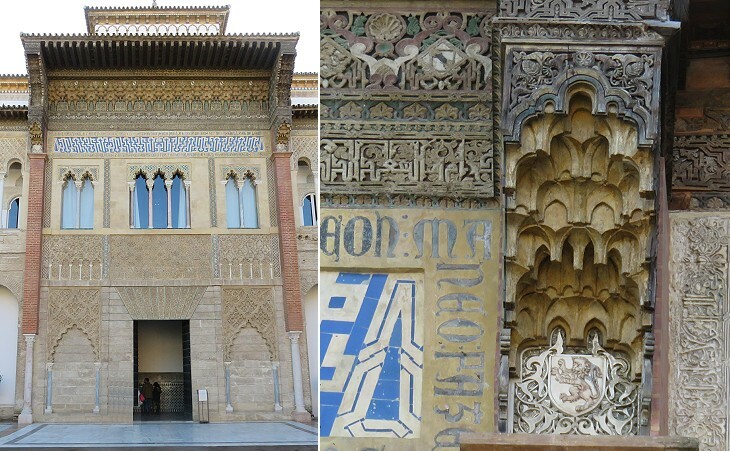 Move to Roman Seville, Moorish Seville or Mudéjar Monuments or return to the introductory page.